Clearer definitions and a taxonomy of games for learning, a central repository, integration into textbooks, evaluation, localisation, a team approach to development, professional support and bridging home and school - these are some of the fifteen recommmendations of the two-year IMAGINE project. One of the key outputs of the two-year project, funded by the European Commission under the Lifelong Learning Programme, is a report and a set of recommendations to increase mainstreaming of games for learning in schools, vocational and adult education. The report outlines conclusions related to the use of digital games for learning, as they affect education policy-makers and decision-makers in school, vocational and adult education, presents the underlying evidence behind them and makes a series of recommendations arising from the conclusions and evidence. "This grand vision of the integration of gaming culture with school culture will require a tremendous effort on the part of all involved – schools, parents, academics, government agencies, non-profit agencies, gaming professionals, and others. Providing access for all students to the kind of playful, investigative, collaborative and well-supported education that we envision in this document will necessarily depend on school culture and gaming culture coming to a respectful, mutual understanding and comfortable integration. Certainly, teachers and schools will have to take brave risks to innovate, but the learning games community will need to meet schools, understanding the constraints on the system and individual teachers." and both motivate and inform those wanting to participate in this rapidly growing domain. Harness children's interest in the World Cup by organising football-based competitions between classes using the popular and free Footee. With 50,000 users and numbers doubling every six months, Footee builds on football’s appeal to young people 6 to 12 and their love of games, competition and social networking to make learning maths, language, science, geography and history effective and fun. Coinciding with the World Cup is a new feature, enabling children to pool the reward points earned playing games and a class can then run their own Footee team and take on other teams in the same or different countries. Users only see their own language which means, for example, that an English school class can take on a Spanish one and each sees it in their own language. This motivates the children to try harder so the whole class / team can benefit. How electronic games can be used in school to teach in innovative ways was the topic of a workshop at the EMINENT Conference on 4-5 December 2008. The initial findings of the Electronic Games in Schools study, conducted by European Schoolnet with the financial support of the International Software Federation of Europe (ISFE), was presented to participants at the workshop. EMINENT is European Schoolnet's annual networking event, bringing together more than 240 policy makers, industry representatives and education practitioners. As part of the Games in Schools project, European Schoolnet has published a bookmark - a handy tool for books' enthusiasts willing to participate in the ongoing survey about how educators use electronic games in teaching and learning. The bookmark, which reads "computer games are now part of everyday life for many children in Europe...some innovative teachers are using games in schools - but how", invites teachers to take part in the European-wide survey at games.eun.org. For more information about this please contact Caroline Kearney at European Schoolnet. 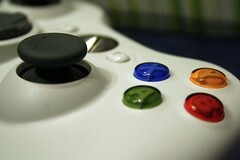 Win X-box 360 Elites and a pack of child-friendly games by filling in our survey! Adventure games, role plays, arcade, strategy games, simulations, driving games, puzzles, brain gym … We hear more and more about computer games and they are getting more and more sophisticated, but what is their place in school? Are they useful or dangerous? Opinions among teachers seem to be divided with some enthusiastic teachers using them effectively, some sceptical and some hostile. What is your opinion?